If you purchased a phone adapter (ATA) from us, we have already configured it for you. All you have to do is to connect it to your router via the Ethernet wire and then plug your phone into Line 1. Alternatively, you may connect it to the wall enabling your entire residence phone wiring to use your VOIP connection, via any jack or the demarcation point. If you still have a regular phone in your home or if you plan to use our services in a business environment you are wise to consider a sturdier, stand-alone, physical device other than your smartphone. An ATA will allow you to keep your existing phone or you might want a special phone that connects directly to VoIP networks via the Internet (IP Phone). 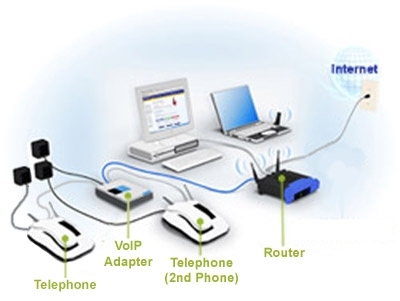 ATA: An Analog Telephone Adapter (pictured above as "VoIP Adapter" is a device used to connect one or more standard analog telephones to a digital telephone system (such as Voice over IP) or a non-standard telephone system. IP Phone: An IP Phone is essentially an ATA-phone combo. You plug it into your ethernet jack or, if it's wireless, you configure it to connect to your WiFi router. Most people will find an ATA and a regular phone sufficient. As IP Phones drop in price they may become more affordable and offer more features than a regular phone + ATA setup could.